Scarecrows are known for their twisted sense of humor. In an age of GPS devices and online maps, many of us are still fearful of getting lost -- actually, our dependence on all our getting-there gadgets has made some of us even more fearful of losing our way, especially if alone or at night. That strange location can be continents away or a couple of towns over. 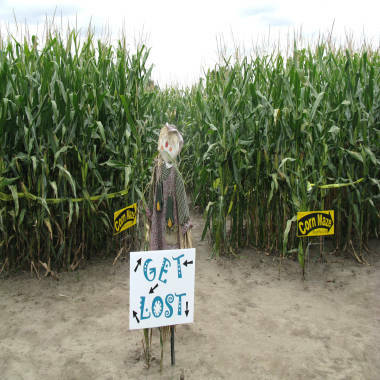 Or even a corn maze, which recently happened to a Massachusetts family, who were so spooked they called 911 for rescue. When you search the words "fear of getting lost," you'll find some sites claiming this is called "mazeophobia." But that term doesn't appear in any medical dictionary or scientific literature searches, and it's not mentioned in any of the psychological textbooks used by Luana Marques, a clinical psychologist at Massachusetts General Hospital in Boston, who treats people with and does research on anxiety disorders. Fear of getting lost may not be a clinical diagnosis, but Marques says a patient might complain of a fear of driving and a fear of unknown places. "What that person is really afraid of is being in an uncomfortable situation that triggers the fight-or-flight reaction," Marques explains, referring to the alarm response that can make your heart race, palms sweat, hands shake and breathing quicken. But fear doesn't only affect you physiologically; it can also cloud your judgment. Once the alarm response is activated, you lose some ability in the rational part of your brain, explains Marques. "That doesn't mean you can't make rational decisions, but your ability to think clearly and logically in the moment becomes less and less," she says. If a fear is significantly interfering with your life, cognitive behavioral therapy can help you get over it, Marques suggests. Otherwise, she says, the rule of thumb is to "approach and not avoid" the situation. Take small steps to expand your comfort zone, so it makes you "comfortably uncomfortable," Marques recommends. That may mean road trips armed with maps, printouts of directions and your favorite person on speed dial who is not directionally challenged. Or doing a dry run to a destination, when possible. It's no guarantee that you'll never get lost, but at least, you'll wrack up more successful experiences in finding your way. Readers, are you afraid of getting lost -- and have you gone to great lengths to avoid it?